So this is my plan......hopefully we can stick to it. I will need to look up more recipes, these meals are getting boring already! What's your meal plan? 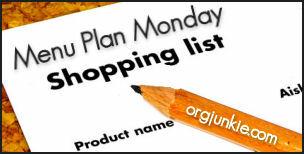 Check out I'm an Organizing Junkie for more ideas and to link up! I'm visiting from Organizing Junkie today. Happy MPM.